Queen of Riches video slot powered by Big Time Gaming has 6 reels on 4 rows with an incredible 117,649 ways to win! 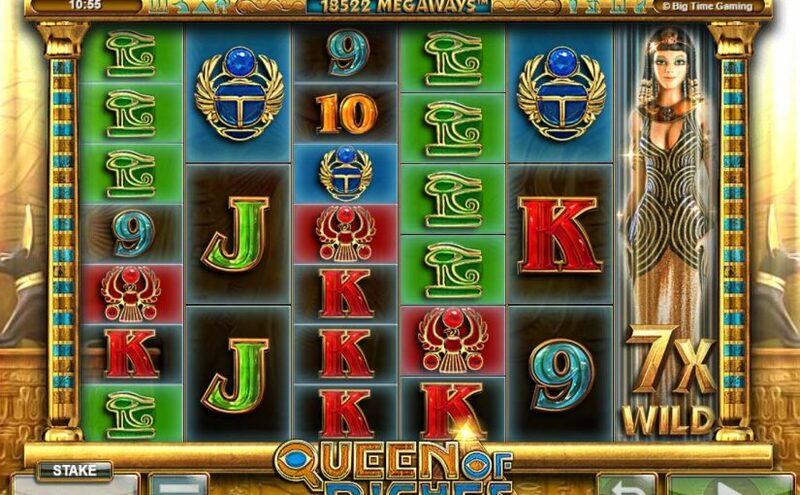 The theme of Queen of Riches is based on the Egyptian iconography – a classic theme made modern, innovative, and creative. With this excellent quality, it also offers some generous features. The Full Reel Wild will activate when the Egyptian queen appears on a full reel. As she covers the full reels, this covers for 7 icons, meaning that you can get up to 49 times your winning combination as she steps in to substitute for any other symbol. Queen of Riches also offers the cloned reels, meaning that every spin can produce between 2 and 6 identical reels. They can be cloned to create as many as five sets of multipliers which are randomly assigned.